This document explains the CI process for the fabric repository. The following steps explain the execution process when a patch set is submitted to the fabric repository. At whatever point a patch set is submitted to the Fabric repository, Jenkins triggers the CI build process to test and validate the patch set. 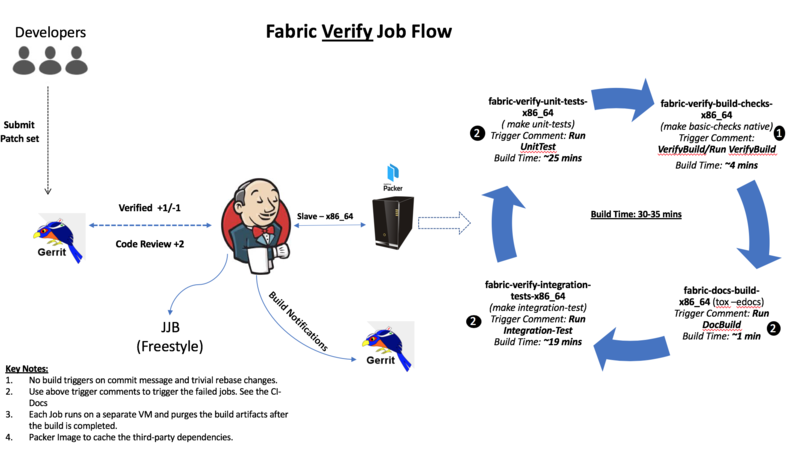 The Fabric CI verify and merge jobs are configured to test patch sets in the jenkins environment. There are several job types that are common across all Hyperledger Fabric projects. In some cases, all of the common job types are not in every project. This depends on the specific needs of the Hyperledger Fabric project being developed. The CI configuration is prepared using Jenkins Job Builder to create, update and modify each of the Jenkins Jobs. As part of managing jobs ran by our Jenkins servers, we create JJBs (Jenkins Job Builder files) in YAML format to configure Jenkins jobs. JJBs have a flexible templating system, so creating multiple jobs with a common configuration is straightforward. You can find more details about Jenkins Job Builder on the JJB webpage. The following steps explain what happens when a developer submits a patch set to the fabric repository. At the point when a patch set is submitted to the fabric repository, the Hyperledger Community CI server (Jenkins) triggers Verify jobs on x86_64 platform using the patch set’s parent commit which may or may not be the latest commit on fabric. 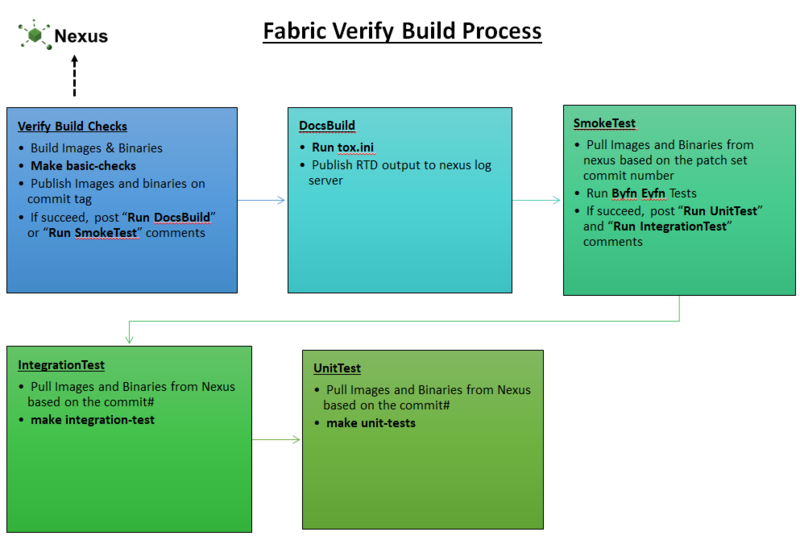 The Fabric verify build process is split up into multiple jobs. fabric-verify-build-checks-x86_64 job is triggered when a patch set is created and it validates the patch sets git commit message. If the commit message in the patch set contains ‘WIP’, the above build job ignores the build process and will not post a vote back to Gerrit. This means that this job is essentially skipping the build process. As a result, you will see “WIP - No build” in the patch set’s comment history. If the patch set is not marked as ‘WIP’ in the commit message, and if it is a documentation change (which is defined as a patch set with changes solely on these file extensions (.rst, .md, .py, .png,.css,.html and .ini), the above job posts the Run DocBuild comment to the patch set in Gerrit and sends the following votes against the patch set: F1-VerifyBuild=+1 F3-IntegrationTest=+1 F3-UnitTest=+1. This comment triggers fabric-docs-build-x86_64 CI job. Once the doc build is successfully executed, Jenkins sends Gerrit a vote of F2-DocsBuild=+1 on a successful build of the docs, or in the event of a failed doc build, a vote of F2-DocsBuild=-1 is sent. If the patch set is not marked as ‘WIP’ in the commit message, and there are code and documentation changes, fabric-verify-build-checks-x86_64 executes the flow described below. This flow also applies to the code only patch set excluding documentation build process. This comment triggers fabric-docs-build-x86_64 job and posts a vote of F2-DocsBuild=+1 to Gerrit if successful, or F2-DocsBuild=-1 in the event of a failure. You can review the RTD output from the doc build on the nexus log server. Extracts the documentation files(.md, .rst, .txt, .py, .png, .css, .html & .ini) from the patch set submitted and builds the documentation after verification checks like syntax, and tox verification.This job is triggered only when a patch set contains documentation files. Once the documentation build is successful, it is archived, and published on the Nexus repository. This comment triggers fabric-verify-integration-tests-x86_64 job and posts F3-IntegrationTest=+1 on a successful run of the integration tests and a F3-IntegrationTest=-1 in the event of a failure. This comment triggers fabric-verify-unit-tests-x86_64 job and posts F3-UnitTest=+1 vote against the patch set if successful, otherwise a vote of F3-UnitTest=-1 is submitted. patch set is not eligible to merge, if it even gets one -1. The Fabric merge build process is split up into multiple jobs. Once the patch set is approved by the maintainers ofthe fabric repository, they will merge the patch set which triggers the Merge jobs mentioned above on the latest Fabric commit (note: this process does not use the patch set’s parent commit). Step 1: Builds the fabric images and binaries and third-party images (Kafka, Zookeeper, CouchDB) by using make targets. Clone the latest commit from the fabric-ca repository and then checks out the branch associated with the patch set. If the patch set is triggered on the fabric-ca release-1.1 branch, the script will checkout to the release-1.1 branch. 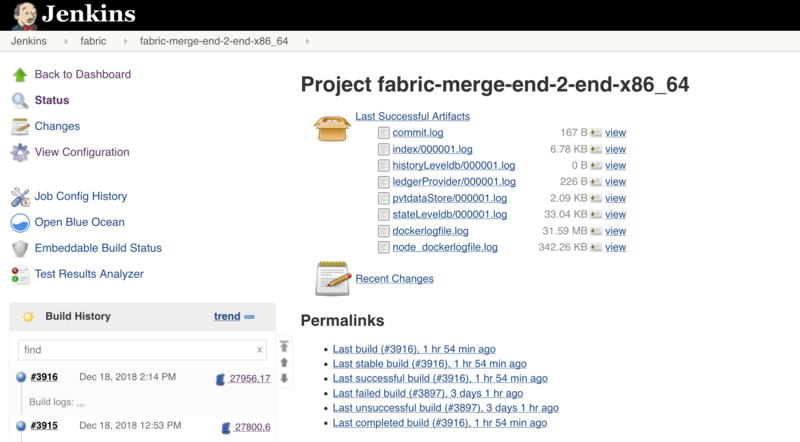 After the fabric-ca repository is cloned in the above step, the CI script proceeds to build the docker images that will be used to run the end-to-end (e2e) tests. e2e-node - Runs the sdk-node e2e tests (Executes gulp test command). e2e-java - Runs e2e java integration tests. If the patch set is on release-1.0 branch, CI skips the java e2e tests for now. TODO# mention the JIRA FAB here. Pulls the fabric-javaenv from nexus and fabric baseimage version third party docker images (kafka, zookeeper, couchdb). The image name is appended with ‘hyperledger’ and tagged with the latest tag. After the verify or merge tests are executed, It is time to archive the logs (artifacts). CI publishes the logs(artifacts) on Jenkins console. Jenkins sends the build failure email notifications to the CI team. VerifyBuild – Triggers fabric-verify-build-checks-x86_64 CI job, developers have to check the result of this job before posting the below comments on the patch set. Run UnitTest - Triggers fabric-verify-unit-tests-x86_64. Run IntegrationTest - Triggers fabric-verify-integration-tests-x86_64. These comments trigger specific Fabric verify jobs. Once the build is triggered, you can verify the Jenkins console output and go through the log messages if you are interested to know how the build is actively making progress. With the existing Jenkins configuration, when rebasing a patchset from gerrit, Jenkins will not trigger the builds if it is a trivial rebase. What is trivial rebase means? Conflict-free merge between the new parent and the prior patch set. How to trigger manually from Gerrit? Post “Run VerifyBuild” or “VerifyBuild” comment phrase and click on post. With the existing Jenkins job configuration, Jenkins will not trigger jobs on commit message changes. 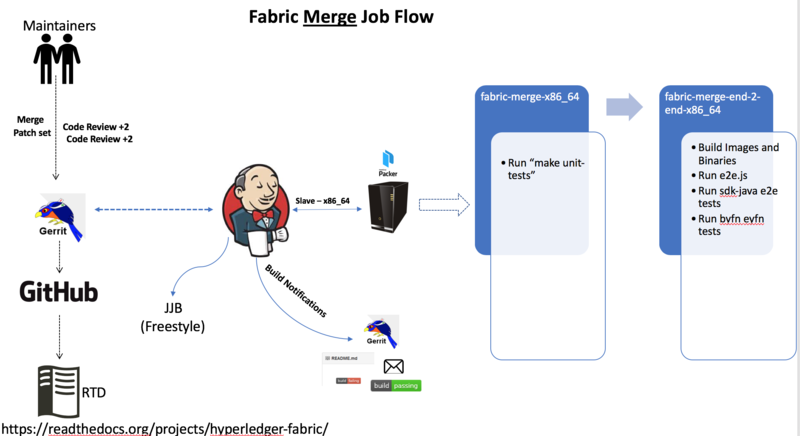 Please reach out to us in https://chat.hyperledger.org/channel/ci-pipeline or https://chat.hyperledger.org/channel/fabric-ci RC channels for any questions.